The hustle and bustle in big city may make you want to enter into the big nature. After all, the beauty of nature is always full of great attraction. Sometimes, the most charming view lies in the most dangerous place. Usually, SUV is the main travel tool, but it can’t reach the deep nature. Now, a brand-new travel transport will take you to the deepest place of the nature and personally feel its greatness. The name of such a travel tool is the famous Fosjoas U3 SUV electric unicycle, which will make you fall in love with travel. Why is it called SUV scooter? It has two main reasons. On the one hand, Fosjoas U3 two-wheeled electric scooter has two 16-inch tyres. Meanwhile, these two tyres are much thicker and wider than that with the same size. Therefore, they have much stronger road holding capacity, skid resistance and adaptability to some difficult road conditions. It seems as if Fosjoas U3 two-wheeled electric scooter has the function of SUV. In fact, it can reach many places that SUV can’t do. 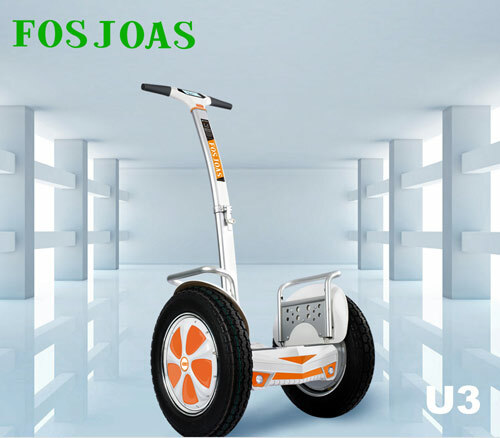 On the other hand, Fosjoas U3 electric standing scooter also can be an excellent partner of SUV. The adopted foldable control shaft paves the way for Fosjoas U3 two-wheeled electric scooter to put in trunk of SUV conveniently. If your destination is far from your city, you can drive your SUV and take Fosjoas U3 scooter at the same time. Fosjoas U3 is also called electric two wheeled scooter. Why? It is because realizing all controls relies on adjusting body gravity. For example, stand on Fosjoas U3 and slightly lean forward. It will move forward automatically. If you further lean forward, its speed will be faster and faster until reaching the maximum speed. What is more, the small figure will take you to every corner of the real nature.